"Last June, photographer Caitlin Cronenberg spent a full day snuggled up on her couch with her laptop, a cup of tea and a hard drive holding 54 folders filled with scanned photos from the New York Times Canadian Photo Archive. She didn’t move for eight hours as she examined about 24,000 photos, using her gut to decide which ones should be mounted and displayed in RED, an exhibit set to go on display in September as part of last year’s Toronto International Film Festival. After several days, she had narrowed the photos down to 40. By the time the exhibit launched, there were only a dozen. Christopher Bratty, co-founder of toromagazine.com and Black Angus Media, purchased the archive’s collection of photos in an effort to trace the evolution of Canada over the past century. He then commissioned Cronenberg to use her bold and contemporary artistic vision to curate RED, which is now a part of Toronto’s CONTACT Photography Festival, featuring eight photos from the original exhibit that will be mounted at KWT Gallery until May 31. The photos from the archive date back to 1910 and cover a diverse assortment of themes. Notable photos of Canadian icons include Pierre Trudeau, Karen Kain and Barbara-Ann Scott, while others feature international figures on official visits to Canada, including the Royal Family and Winston Churchill. But these aren’t the images that will be on display at RED. “We wanted to use photos that showed Canada in a way that we haven’t really seen before,” says Cronenberg, daughter of acclaimed Canadian director David Cronenberg. 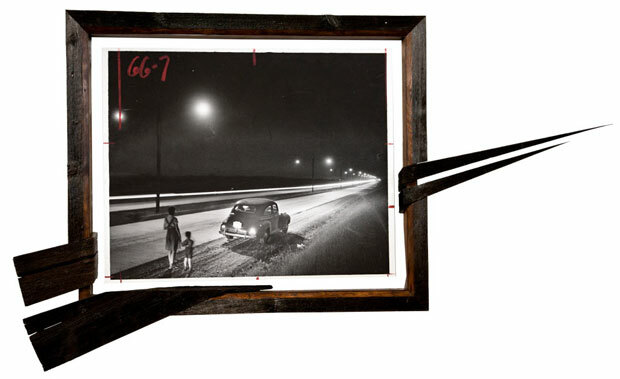 The photographer’s favourite image is QEW at Night, which shows the Ontario highway back when it was just a car stop. Other personal highlights include Virgin Mary on a Plane, which tells the story of a priest who flew a statue of the Virgin Mary all over the world for missionary work; and Nurses in NY, which depicts a group of Canadian nurses in long black coats and hats standing on the roof of the Empire State Building." Opening reception tonight, from 7:30 to 9 pm.